The 146-year-old Baptist congregation hopes a smaller footprint will allow the church to redefine its mission and identity while saving its historic sanctuary. Scattered among the church’s three large buildings that cover an entire city block in Winston-Salem, North Carolina, were 49 Sunday school classrooms. Repairing the historic sanctuary is one of the priorities under the new plan. The church now has a block-long footprint. In those days, First Baptist Church on Fifth, one of the city’s most stately and historic congregations, had more than 2,000 members and had grown to encompass 114,000 square feet of space, including a gym and a chapel. Yet even then, classrooms stood empty during the week. Lolley, one of the most forward-looking pastors of the era, agreed with Moore, and the church founded the county’s first racially integrated day care for children ages 8 weeks to pre-K (plus an after-school program for children through age 12). This month, the five-star center will close as the church prepares to tear down two of its buildings in a revitalization effort aimed at pushing a now much smaller congregation into the 21st century. After months of investigating options for keeping the center open or moving it to a new location, the church could find no viable solution for its signature ministry, which it subsidizes with $100,000 a year. The church's daycare, as well as the playground behind the church building, are slated for removal. Scores of mainline Protestant and Catholic churches are making similar, often painful choices. 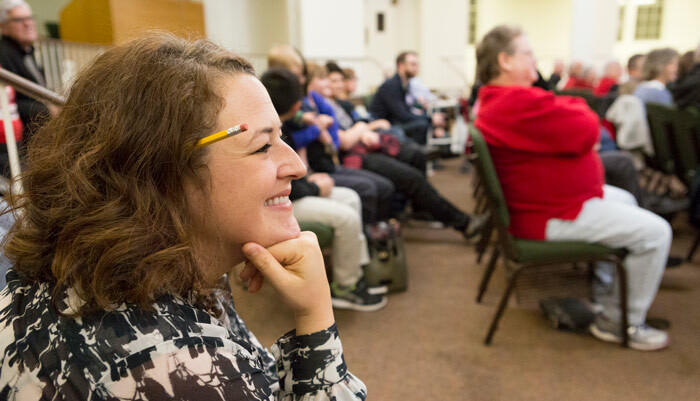 Faced with crumbling infrastructure and costly maintenance that consumes an increasingly large slice of church budgets, congregations are looking to downsize and at the same time reimagine a different vision for ministry. What is the cost to your organization of -- metaphorically or literally -- "keeping the lights on?" Church building experts see this happening across the nation. In their zeal to build, post-World War II Americans left future generations with hulking edifices that now stand as testaments to outsize ambition. These days, groups such as the UCC Church Building & Loan Fund, the oldest society of its kind in the U.S., do more consulting than church financing. About two-thirds of the loan fund clients are congregations figuring out how to repurpose, reuse or rethink their buildings. “Most churches have an upside-down relationship with their building,” said the Rev. Patrick Duggan, the executive director of the Church Building & Loan Fund. What kind of relationship does your organization have with its buildings or other facilities? At First Baptist Church, members are righting that ship. They have slowly but decisively concluded they must raze two later additions, including the brick edifice that houses the Children’s Center, while repairing and upgrading their original sanctuary building. This Advent season, they are taking stock of their assets and trying to imagine what purpose and mission will carry them into the next decade. For many in the church, it is a time of waiting. As its name suggests, First Baptist has long been a trailblazer. Founded in 1871 at a time when the region had more Moravians and Methodists than Baptists, the church was instrumental in birthing Baptist churches in every quadrant of the town. One of its early pastors, H.A. Brown, helped organize the local Baptist association, which led the founding of several dozen more churches. The current sanctuary, completed in 1925 in the Greco-Roman style, is round and seats 1,200. Green Corinthian columns support a soaring domed ceiling. The church reached its apex in 1957 with 2,800 members and another 700 nonresident members. It had already built Building B to accommodate all those members, and in 1961, it completed Building C. Not only did the church open the first downtown gym; it also hired a minister for youth and recreation -- a novelty in those days. The church gymnasium is slated for removal even though longtime members have happy memories of events here. Kim Towles, church chair of personnel, and the Rev. Amy Mcclure, associate pastor, inspect roller skates and rollerblades in storage. Skating events were once very common at the church. Even when church events like this supper are well attended the enormous room is only partially filled. Scattered among the church's three buildings are 49 Sunday school classrooms. Older members have fond memories of the gym. Beginning in 1967, the church also had the Children’s Center. The yearly budget paid for the upkeep of the center, including utilities and cleaning services. Tuition paid for the teachers’ salaries and supplies. Most of those enrolled in the day care were not the children of church members, but the congregation kept its commitment to the town’s black and white working families. Most people in town would have known First Baptist on Fifth principally because of the Children’s Center at a time when so few offered such a service. Yet despite its vibrant pastor, who went on to become president of Southeastern Baptist Theological Seminary in 1974, the church’s Camelot days were ending. Though Baptists are still the largest denomination in North Carolina, downtown churches such as First Baptist, which is affiliated with the moderate Cooperative Baptist Fellowship, have seen a 40-year decline, as suburban churches often overtake them in numbers. Today, its $1 million annual budget includes $340,000 to keep up its facilities. Utilities cost about $10,000 a month. The downtown has newer, more modern gyms, and the church is no longer a hub for family outings. The buildings -- with their linoleum floors and fluorescent lights -- have fallen into disrepair, evident not so much in their physical appearance as in their internal workings: the boiler, the roof, the masonry are all in need of major upgrades. As important, the church has far fewer members -- some 500 active members (and another 700 inactive members). Sunday worship draws about 220. Can you identify assets that your organization possesses? Which ones fit with your current mission? Which do not? Earlier this summer, church members voted nearly unanimously to tear down the two buildings. First Baptist Church is ready to lead in new ways. McGee looks on admiringly at the kids performing a musical program after a church supper. When she arrived two years ago, McGee knew the buildings were in significant disrepair. The copper dome atop the historic sanctuary was leaking; water damage from the roof was causing the plaster in Building C to flake off; the masonry on the terra cotta and limestone cornices was crumbling; and the boiler serving all three buildings needed to be replaced, as did the underground pipes. During her interviews for the senior pastor position, McGee learned that the church was already discussing the campus’s sustainability. A research group had been formed to study the facility, and its members recognized that the church was at a crisis point. Is your organization at a crisis point? How would you recognize such a moment, and how would you respond? “When I came in, I knew the facilities were a problem and that I would need to tackle it pretty quickly after I got here,” she said. The 36-year-old mother of three is the church’s first woman pastor. And she is uniquely qualified for the role. Her grandfather, William Hull, was dean of theology at Southern Baptist Theological Seminary in Louisville, provost at Samford University in Birmingham and longtime pastor of First Baptist Church in Shreveport, Louisiana. Her father, David Hull, was pastor of First Baptist Church in Huntsville, Alabama. He now teaches and consults while his wife, Jane, McGee’s mother, serves as pastor of Union Christian Church (Disciples of Christ) in Watkinsville, Georgia. Pastoring is in McGee’s DNA. Still, shepherding First Baptist in a new direction weighed on her. The research group had already suggested tearing down one of the buildings. But its report was not binding, and McGee quickly formed a new committee to bring a recommendation to the membership for a vote. That committee set out to examine all options. “We all started thinking we’d figure out some way to save all the buildings,” McGee said. But the results of an engineering study made it clear to committee members that the challenges were significant. Repairing all the buildings and bringing them up to code would cost $8 million to $10 million. Critically, the repairs would not save the Children’s Center. 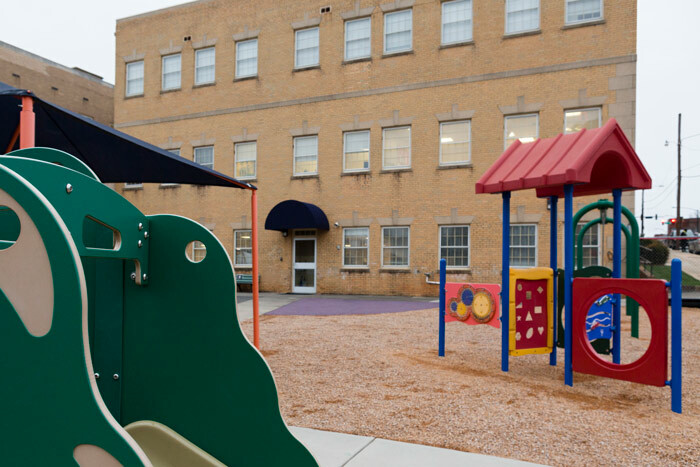 The state now requires day care facilities to be on the ground floor with an exit from each classroom. The current day care, which takes up two floors, is grandfathered in. If the church were to renovate the facility, it would have to rebuild the day care from scratch. The committee spent months trying to find an alternative solution for the Children’s Center. It talked to outside partners. It studied other day cares. It priced a free-standing building. It looked at moving the center to one of the other church buildings. No viable solution emerged. Although the congregation largely supported the decision, they did face pushback from families whose children attend the day care. “There were a ton of tears shed this morning,” Meg Shipley, a parent, told the local newspaper upon hearing that the center would close this month. Ultimately, what brought life to the committee was shifting from the idea of trying to save the buildings to that of tearing them down and renovating the sanctuary building. Winston-Salem’s downtown has been undergoing a revitalization. It now has nearly 4,000 apartment units -- more than half built over the past decade -- and many more in the works. Several top hotel chains have announced plans to open. Is there momentum in your community toward growth and thriving? How could your organization be a part of it? What if First Baptist were to tear down its crumbling buildings and be part of that revitalization? From that point on, the committee focused its efforts on presenting the church with a scaled-back plan for a smaller campus -- minus buildings B and C -- that would meet the needs of a smaller but more nimble congregation. 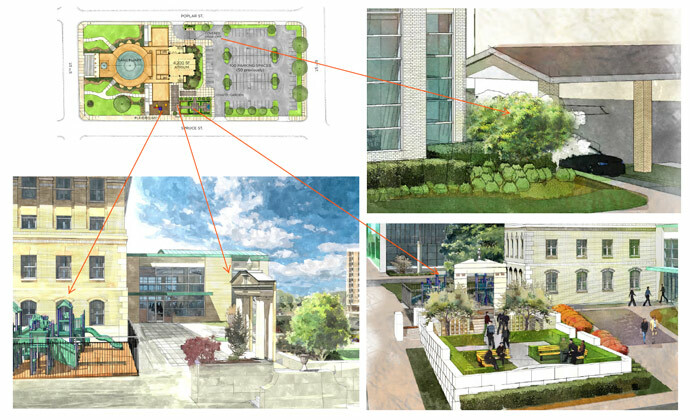 On a Wednesday night in November, after a supper of lasagna and garlic bread, Knight, the committee chair, and McGee unveiled a PowerPoint presentation for a $5 million to $6 million renovation of the sanctuary building and the addition of a 4,200-square-foot glass atrium to the rear of the building, as well as an outdoor garden. Still ongoing are discussions about the church’s identity minus the Children’s Center, which has defined First Baptist for so long. In conversations during November, the church began the process of envisioning a new mission. Perhaps the church could start a music academy for children, stage public concerts on the front steps of the building, offer Bible studies for young people downtown or partner with the Benton Convention Center one block away. To mark the passage into a new vision, McGee suggested a history wall or mural to be filled with images, artifacts and a timeline that might help the congregation tell its story. The church could even commission artwork for the renovated structure using materials from the buildings that will come down. Church members want to continue the mission Mitzi Moore proposed in the 1960s with the introduction of the Children’s Center. It won’t be a day care, but it will probably involve children. 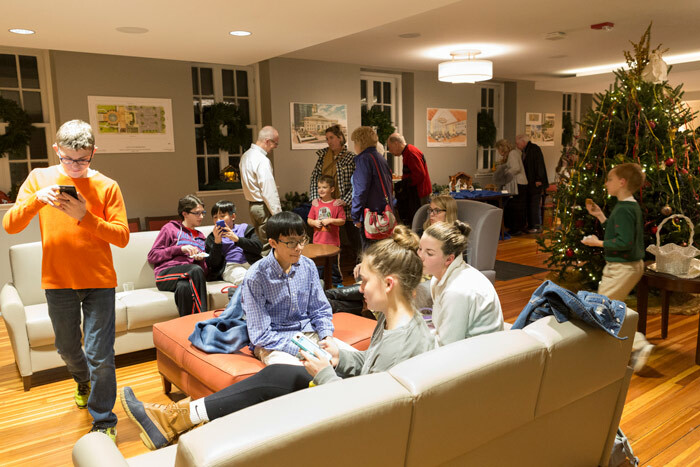 After a musical performance, people socialize in the lounge outside the main sanctuary. Renderings of the new plans are on the wall. For now, church members are captivated by the possibilities. Those include a smaller footprint but a deeper sense of community, a more modest budget but an openness to creating new ministries. In January, the committee is expected to present the congregation with a new mission, vision and values statement. This Advent, it is waiting for that vision to be birthed. What kind of relationship does your organization have with its buildings or other facilities? Is it "upside down?" If so, how might you begin to right it? The Rev. Emily Hull McGee learned the church was at a "crisis point" when she arrived, and that she needed to lead out of it right away. Is your organization at a crisis point? How would you recognize such a moment, and how would you respond? 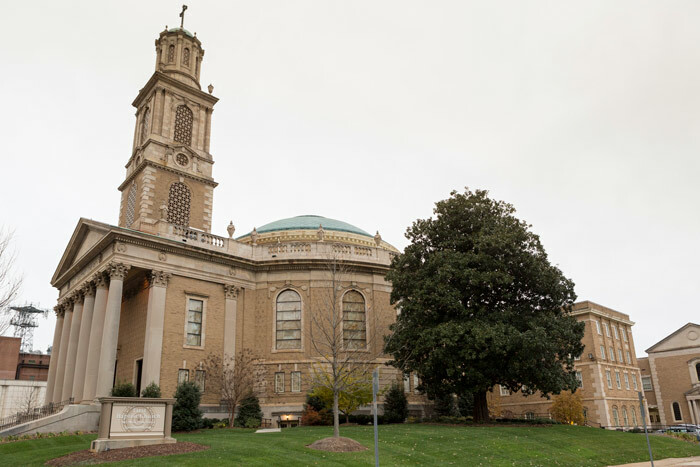 First Baptist decided to join in the revitalization of downtown Winston-Salem. Is there momentum in your community toward growth and thriving? How could your organization be a part of it?